Dairy farming is a job governed by milking times and milk volumes. It's a job that is hard on both the farmer and his machinery, with each and every day, man, machine and even animal needing to perform in perfect unison to ensure the production of milk stays on track. Dairy Farmer Tom Walsh from Tongala, some 225km from Melbourne in northern Victoria knows this well, which is why he trusts his New Holland L220 Skid Steer Loader. of the most stable machines on the market with one of the widest, most comfortable cabs in the industry that provides more head and foot room, and twice the visibility in critical zones. All this means more comfort for the operator allowing him to work longer and more efficiently. According to Tom, the New Holland Skid Steer is proving to be a machine with a multitude of uses around the farm. 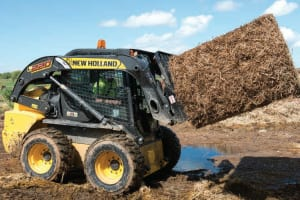 "We have 250 acres and 300 dairy cows - all Jerseys - and we use the New Holland Skid Steer Loader for a variety of day-to-day tasks including, loading feed onto a truck and generally moving items around the place." "We also use it for more traditional purposes such as moving dirt around the farm every now and then," he said. "I like how comfortable the L220 is – I sit in the cabin anywhere from 1 to 7 hours per day depending on the job, and it's great to be up in a comfortable cabin, especially one that has radio." Despite the common image of Skid Steer Loaders being more at home on the construction site, operators like Tom Walsh are finding that agriculture is also a natural home for machines like the L220. "We need a machine that is quiet and efficient so as not to startle the cows which will affect their milk output, and also a machine that is small enough to get through all the nooks and crannies in and around the sheds while also having the power to move whatever needs to be moved." "The L220 certainly ticks all those boxes," said Tom. "My L220 Skid Steer Loader is a great piece of machinery- it's fast, quiet, reliable and comfortable, and lets me get all my farm jobs done quickly and without any fuss," noted Tom. With New Holland's ground-level service checkpoints that are easy to access and the new flip-top cab that tilts forward for complete component access, there'll never be any reason for L220 owners to cry over spilt milk. When there is a need for regular servicing, New Holland dealer Melbourne Tractors is Tom's dealer of choice. "Their servicing regime is really good," said Tom, adding that, "when we need a mechanic to do a scheduled service on the machine, they send someone straight up here to the farm, which is about 3 hours away from Melbourne." As Tom said, "the New Holland L220 Skid Steer Loader is a reliable all-round workhorse," and that's no bull!